Very successful mixing of old with the new at Norwich's King of Hearts last night in a concert by the quartet of musicians who make up the London Handel Players. The programme included J.S and C.P.E Bach, Handel, Leclair and Barry Guy's admirably uncompromising 1985 "Whistle and Flute" for flutes and eight track tape which was played by the flautist it was written for, Rachel Brown. But the highlight of an outstanding concert was Bohuslav Martinů's 1940 Promenades for flute, violin and harpsichord, with its angular rhythms and sparkling writing for the harpsichord. A little known gem, and one that had me revisiting some of the many Martinů recordings in my collection. My love for Martinů's music was sparked by Václav Neumann four LP set of the symphonies with the Czech Philharmonic on Supraphon which dates from the late 1970s. When the CD age dawned I bought Bryden Thomson's Chandos set of the symphonies (now deleted) with the Royal Scottish National Orchestra. But sadly that set doesn't have the Slovak 'edge' of the Neumann records, or is that wonderful analogue sound on the Czech LP pressings? There is much other wonderful Martinů. The Cello Concertos are under-rated, while the Field Mass and opera The Greek Passion are both masterpieces. (The Greek Passion is based on Christ Recrucified , a novel by Nikos Kazantzakis, which opens up another path). Two personal favourites among Martinů's orchestral output can be found on an Erato double CD, the Double Concerto for string orchestra, piano and timpani, and the sublime Frescoes of Piero della Francesca. The Erato CDs are now deleted (which is probably a measure of how far Martinů has fallen out of fashion) but you can still find them. 2009 brings the fiftieth anniversary of Martinů's death. Hopefully this will mean more Martinů and less of some other composers. Meanwhile the King of Hearts' innovative Autumn Festival continues in a few minutes with more Bach, and on Saturday evening Jane Chapman's harpsichord recital includes music by Ligeti, Takemitsu and Jeremy Peyton-Jones, as well as by Rameau, W.F, Bach and Haydn. Thank goodness some concert promoters are still prepared to take risks. 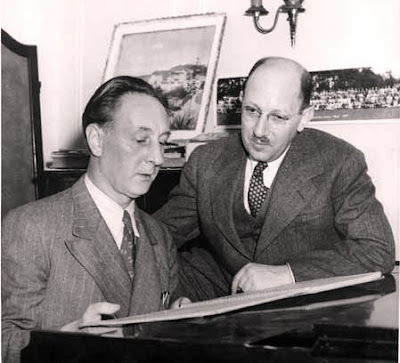 My photo shows Martinů (right) with the American composer Frederick Jacobi and comes from an excellent article by Anton Wagner. Now download some other Czech delights here. I can never get enough Martinu. The symphonies are a masterpiece.And the surreal opera Juliette, or the Key to Dreams is just out of this world. Martinu's music is very seldom performed in the U.S., and I have always regretted that. I have greatly liked every piece of Martinu's music I have ever heard. The last conductor working here who programmed a Martinu composition every now and then was Dohnanyi when he was at the helm of the Cleveland Orchestra. There is another (deleted) set of Martinu symphonies that is quite good, a set Claus Peter Flor recorded in the late 1980's for RCA. It did not last very long in the domestic catalog, however. Drew, kind of ironic, isn't it, that Martinu is rarely performed in the US? He left France for the US in 1941, and became an American citizen in 1952. But he returned to Europe in 1953, and died there in 1959. There is an MP3 file of an interview with Martinu, in English, here. Duration is 2.57"
Yes, it is ironic that Martinu's music gets performed so seldom in the U.S.
With reference to my earlier post, I should have mentioned that Claus Peter Flor, during his years as Principal Guest Conductor of the Dallas Symphony, DID perform a few Martinu works. In fact, Flor's performance of the Third Symphony is still talked about in Dallas. Thanks for the Martinu interview link. As a fellow East Anglian and music-follower I've read your blog with great interest for a while now, and I've always enjoyed reading your informed opinions. Today I felt moved to write as Martinu has long been a favourite composer of mine (since playing his extraordinary Memorial to Lidice with my County Youth Orchestra, many years ago..) and it's lovely to read something (anything!) about him for a change. I wonder if you've heard his surrealist opera, Julietta (or The Key to Dreams) after the play by Georges Neveu. (I have it on an elderly Supraphon CD which is also no longer available, sadly). It's a really glorious work which has never received the attention it deserves - it meant a great deal to the composer, and he was working on revising it while on his deathbed. If you've never heard it I thoroughly recommend it! All best wishes with the blog, long may it continue! Martinu has a wonderful quartet for Clarinet, Horn, 'Cello, and Side Drum. It such a rarity for percussionists to be involved in a quartet like this. It's a joy to play and great music. You ask, "But sadly that set doesn't have the Slovak 'edge' of the Neumann records, or is that wonderful analogue sound on the Czech LP pressings?" The answer, of course, is that both the Slovak "edge" of Neumann and other Slovak artists, plus those marvelously thick Supraphon pressings were both responsible for some of the great recordings in the history of music. They will never be replaced, oddly enough. Every night of the week at 7pm and midnight Los Angeles gets to hear Martinu on the radio--the third movement from Piano Quartet No. 1 by Bohuslav Martinů.